Although there are a ton of great belts and magazine configurations from all sorts of companies in the USPSA arena (Double Alpha makes one that I like a lot), I wanted something that I could use with the same belt I was already running for general practice/training and IDPA matches. So when I won a gift certificate to Comp-Tac’s website at a major match last year, I started looking around the site to see what I could convince myself that I needed, and the Belt Feed magazine pouch jumped out at me immediately. For one thing, I already had an OWB holster that I really liked for general-purpose stuff. And although Comp-Tac holsters are very nice and I know a ton of people who use them, a holster wasn’t really going to fill a gap that I didn’t already have covered. So I put in the order for the Belt Feed quad mag carrier. And I have used it a ton since last summer. Feature-wise, the staggered design keeps all of the mags within reach, but because they’re set up in two “pairs” of staggered pouches, the mags remain in an intuitive location for people used to carrying or otherwise using double mag pouches. You reach for the “front” twice and then the “back” twice, but the general location is the same as it is with a double mag pouch. So it isn’t difficult at all to run reload drills all weekend with this setup and then go shoot at IDPA match the next week with a standard double mag pouch. The locations and orientation of the mags remain essentially identical and reload results are very repeatable with more conventional carriers, which is good for people who carry a double pouch or otherwise use one a lot. 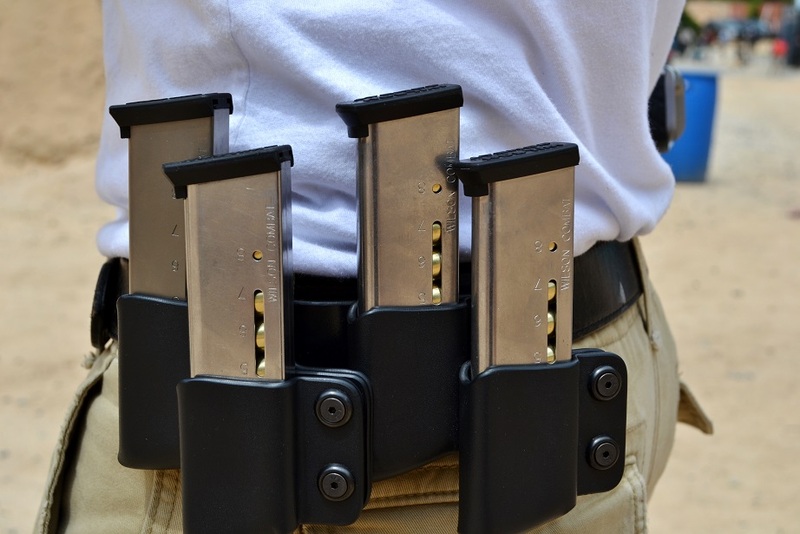 The curved design, which is necessary because of how long the mag pouch has to be in order to hold four magazines, keeps the mags close to your body and it sits very comfortably on a standard gun belt (through the loops). Tension is adjustable via multiple allen screws for each individual pouch, and I’ve had great luck switching back and forth from 9mm to .45 without any retention issues, although some purple or blue loc-tite might not hurt once you get the retention set to your liking. Additionally, this configuration is a lot more practical for running drills that involve repeated mag changes (shoot two rounds—reload—shoot two—reload, etc.) than a double mag pouch. You get in twice as much practice before you have to dust your mags off and start over. In an afternoon at the range, that could translate to better practice. And that’s true regardless of what kind of gun you’re running or how many rounds your magazines hold—as is the fact that this carrier is legal for USPSA. 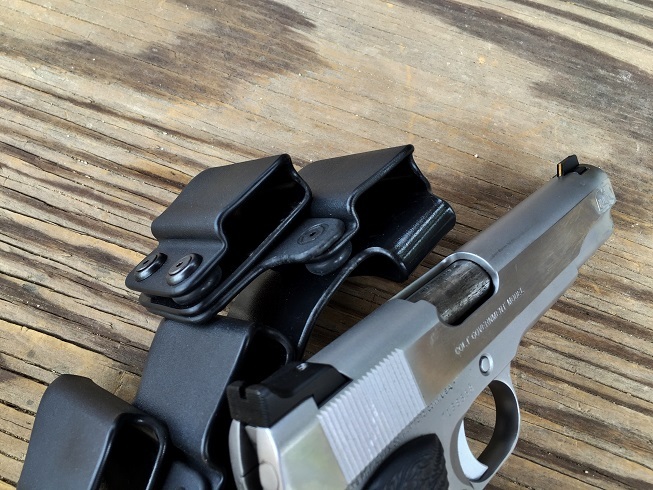 It’s a minimum threshold for single stack guys like me on longer stages, but I would imagine it might be very helpful to guys in the production division as well, particularly if they’re used to a double mag pouch configuration in IDPA. The Belt Feed is also made for any double-stack gun you can think of that’s in widespread use, so if you’re thinking about taking a training class in the near future with your Glock or Beretta and all you’ve got at the moment is a double mag pouch, this allows you to carry the same number of mags as if you bought another double pouch with the added benefit of not having to reach all the way around your back to grab the third or fourth reloads due to the staggered layout of the Belt Feed. The only real negative here to an otherwise fantastic product is that the belt loops are formed from the same sheet of kydex as the back plate on the mag carrier. Although it has been very durable in the almost year that I have owned it (I ordered it July 16th of last year), if you ever did manage to break off one of the belt clips that aspect of the design would make for a more involved repair (ie sending it back for some work or ordering another one) compared to some mag pouches that would just need a new belt clip screwed on at your first convenience. -Colt Driver (all photos by author). Comp-Tac Belt Feed Magazine Pouch; MSRP $121.99; Available for most brands. For more information (or to see what else is new at Comp-Tac), check out Comp-Tac.com.